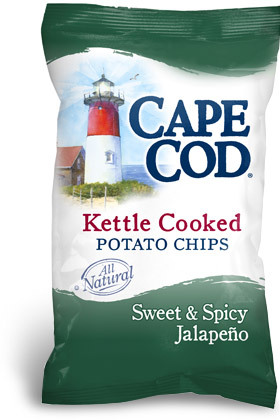 When you look at the Cape Cod logo it is easy to admit you would like to live there! The evocative image of a calm sea in the background of a sun dappled New England lighthouse invites you into a bag of wonder and new experiences. Yes, they have hit the nail right on the head with this outstanding design. As relatively thick Chips these seemed to include a bite like crunch rather than a snappy crackle crisp crunch that is often found with regular cooked standard Chips. Canola oil Cooked Chips seem to leave them brighter and whiter than most other oils. For a negative sounding positive - they are really rather characterless. There are few blemishes. They don't look at all oily. There is little in the way of color. Even the natural curly and squiggly nature of Kettle Cooked Chips wasn't that evident. They were therefore very good. First the Nose Bag Plunge Test: An instant aroma of peppery sweetness. Then the flavor, which has to be said is one of the better Jalapeno flavors available. Sweet & Spicy adds a certain amount of ambiguity to a flavor like Jalapeno Pepper, but it was just subtle enough to enhance the potato flavor, sweeten up the Jalpeno flavor, but maintain a level of heat that you should expect from a fiery pepper Chip. We looked on the bag for a secret ingredient and although there are lots of powders and content, there wasn't one - a great blend.